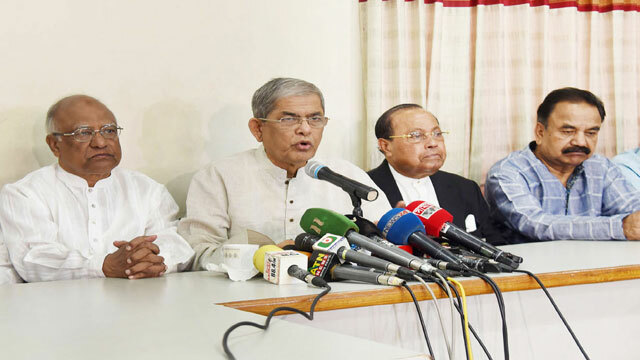 Dhaka, Aug 28 (Just News): BNP Secretary General Mirza Fakhrul Islam Alamgir today said that the upcoming general election would be a great challenge for the ruling Awami League, not for BNP. “People will not cast vote for Awami League. Sensing absolute debacle, it is now resorting to an evil plot by using Electronic Voting Machine (EVM) in the election,” Fakhrul said. The government is letting policemen loose against BNP leaders and activists to arrest them in a bid to make their plot a success, the BNP leader said while addressing a press conference at the party’s Nayapaltan central office in Dhaka this noon. “I believe that people would take to the street protesting the government’s indulgence in misdeeds and mismanagement, and then unseating of the government will be ensured,” he said. Referring to the recent street protests, Fakhrul said people have already thronged the streets and they must turn around and ensure defeat of the evil force from the power. “And then the government’s house of cards will fall apart,” the BNP leader warned. Responding to a query, Fakhrul said the party will go for a tough movement at an appropriate time to ensure release of imprisoned BNP Chairperson Khaleda Zia, who is now staying in the Old Central Jail on Nazimuddin Road in the capital. The current parliament will have to be dissolved and the present Election Commission will have to be reformed, he said, adding that the next general election will have to be held under a non-party neutral caretaker government with deployment of army. “The next general election will not be acceptable if BNP does not participate in it,” he also said. Claiming that the country is passing through a critical situation, Fakhrul said the next general election is important as it will determine the fate of the country’s democracy. He also called upon the mass media and civil society members to come up with a constructive role in restoration of the country’s democracy through ensuring people’s rights to vote freely. Referring to Awami League General Secretary Obaidul Quader’s recent remark that BNP’s political existence will be at stake if it does not join the next general election, Fakhrul said BNP will not get destroyed under any circumstance as it is a favourite political party among the people of Bangladesh. “BNP has been in the current position by overcoming many adverse situations and obstacles. So the party cannot be eliminated from the country,” he said.